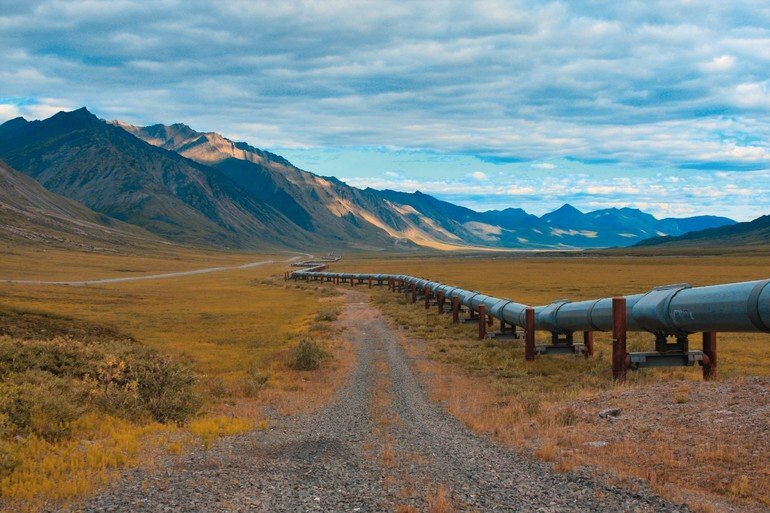 A pipeline in the remote north of Alaska. 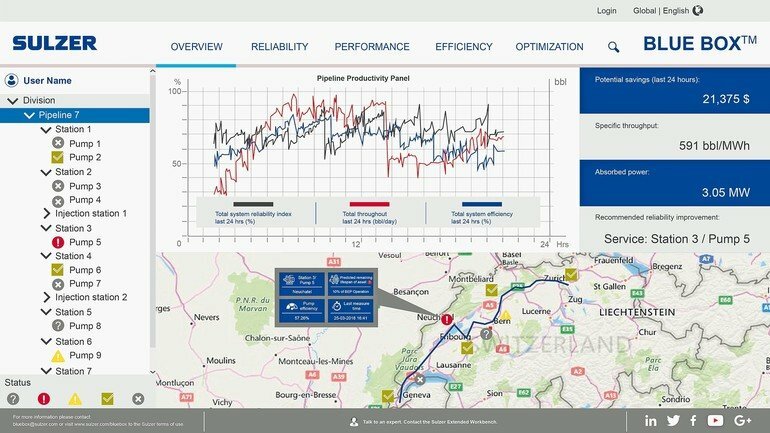 Amongst other things, Sulzer’s Blue Box software provides operators with insights into the efficiency level of pumps and pipelines in the field. What actions are necessary to optimise pump installations and reduce operating and maintenance costs? Sulzer’s answer to this question is the Blue Box. 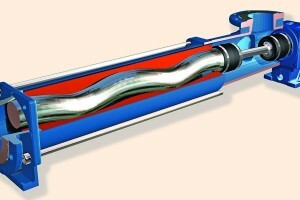 This software is capable of analysing data from any pump or pipeline equipment in near real-time. 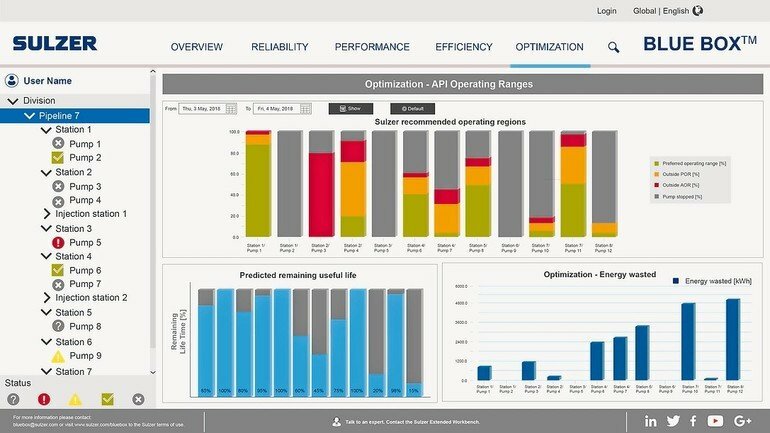 It provides valuable insights, so that pipeline operators can target their actions to optimise the performance of their pumps and pipelines. 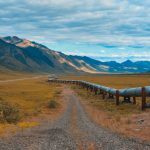 Digital solutions can help industrial pumping and pipeline operations reach their sustainability goals. Put simply, the smart Blue Box software from Sulzer does this in three steps. Using data from a storage system (e.g. a process historian for pipelines). In the second step, all data acquired in the first step has to be analysed and understood. This calls for a combination of pump operator & manufacturer know-how and extensive practical experience. Finally, users can implement targeted actions based on the data analysis. They might decide to check the hardware, for example, perform maintenance, change settings, refurbish a piece of equipment or request expert advice from a service engineer. Sulzer has already supplied a Blue Box solution to a leading US-based mineral oil and logistics company and tailored it to their requirements. Amongst other things, the customer operates two pipelines with 40 performance-critical pumps, which are a mixture of Sulzer and third-party. The software continuously monitors each one individually. The management are hoping to reduce the costs for energy and maintenance and improve pump availability in this way. Case studies have showed that this is a worthwhile investment for pipeline operators. The potential cost saving amounts to several million dollars a year. The Blue Box cuts annual energy bills by up to 5% and the costs associated with unscheduled outages by 20%. The Blue Box generates comprehensive reports which make it a simple task for the operator to interpret the vast amounts of data gathered. These reports draw attention to critical aspects, enabling the customer’s experts to focus on those pumps most in need of attention and plan their maintenance activities accordingly. The information is tailored to each recipient’s individual needs. The visualisation of the overall pump system allows bad performers to be identified at a glance and can be the key to investing in upgrades or new equipment. 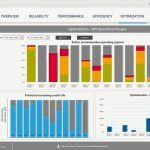 Data on reliability, performance and efficiency sheds light on the condition of assets in the field. The complete overview summarises the performance of the system as a whole. The total throughput, energy consumption and potential savings are all instantly clear. Reliability, efficiency and throughput diagrams provide excellent visibility and highlighting exceptions helps to address the right issues. Since the software accesses an enormous amount of data, preventing data loss or access by unauthorised persons was an important priority for Sulzer’s software developers. 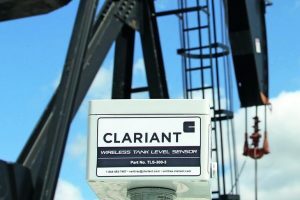 Apart from data on pressure, flow, density, viscosity and power consumption, every pump or pipeline installed in the field also supplies information which is relevant for maintenance, such as vibration and temperature readings. 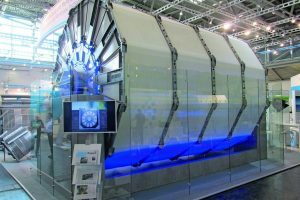 For example, the experience of Sulzer’s experts was incorporated into the program and is used to determine the critical vibration level for a specific type of pump. If the vibration exceeds this limit, the Blue Box highlights this to allow a root cause investigation and avoid costly – and catastrophic – failures. Data is extracted directly from a variety of sources such as SCADA systems, programmable logic controllers (PLCs), process historians, databases and instrumentation. Sulzer can install an industrial-grade computer, known as an edge device, here if required and equip it with firewalls that provide a secure one-way connection (secure data storage and transfer system) to Sulzer’s data lake using a secure file transfer protocol (SFTP). 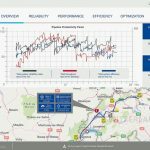 The data is then processed with the aid of proven algorithms, analysed against known performance curves and displayed in a customised interface. This cloud-based solution has only a minimal impact on the customer’s IT environment and is designed to be easily scalable to suit a wide range of applications.